sheepskin side-zips are the winner! I believe the earliest ship date should be September. wtf is up with everyone doing red this season? 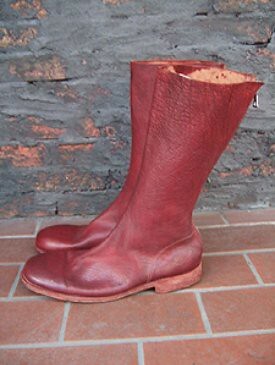 I like that Guidi is experimenting with shapes and styles But that basket weave boot is fugly! Wish Atelier carried a larger range , cause I have fucked myself a few times with the sizing issues. Ooops, totally forgot about this! So, everyone chill out - the below is a very unfortunate sample of the offering. The rest of the stuff is standard issue Guidi - beautiful back and size zips in various colors and finishes, etc. Not too much new, but consistently good. Absolutely love the black basket weave for some reason. The fit pic looks awesome. Yeah they are looking like Bottega Veneta intrecciato weave, but I'm liking the fit pic could be interesting. caus red is hot fire! thanks faust... yes that weave boot is very ala Bottega/Balenciaga/Lanvin clutch..
more more more please but maybe change thread title to just Guidi. The leather on the red derbies is amazing. Hope they do the same in "normal" colours. Yea, you can get a variety. BTW the Guidi's are 50% off at Archive and 40% off at Atelier. But i think i will hold out for a pair of those derbies. The weaved boots are hideous. And the open toe boot is an oxymoron. I think the brick colour works, though. Those hiking boots are cool; would be nice with shorts, although they seem like they may be difficult to pair unless you dress like a lumberjack. I'll be interested to see how they look in person. red isn't a new colour in the guidi palette. 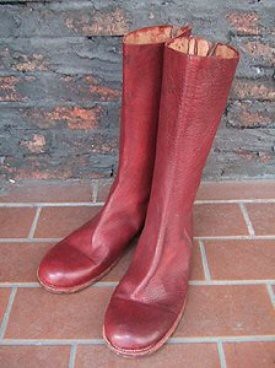 here's a pair of tall boots from circa '06 / '07. I think its the julius tibetan red rider effect! Does anyone know if Guidi makes the same style shoe/boot in different leathers within the same season. I don't mean different colours but actual leathers like horse, cow, kangaroo etc.